Canal & River Trust and many community groups organise volunteer work parties on the Macc! Their dedicated work has earned the canal the very first Green Flag to be awarded to a canal! See Macclesfield Canal Society meetings page for details! The web site is in two parts - this part describes the canal and the features and facilities along its route. The other part tells you about the canal society and its activities. The link list in the left column is different for each part. It is possible to simply skip between the parts by clicking on the appropriate link at the top of the link list. A site map lists all the page subjects. As with many canals, the Macclesfield passed into the hands of the railways for about 100 years. The canal was bought out by the Manchester, Sheffield & Lincoln Railway in 1847. It was managed with the Ashton and Peak Forest canals, which were owned by the same company, and known collectively as the APM Canals. At railway grouping in 1923 the APM found themselves with the LNER. The canals and the railways were nationalised in 1947and the Macclesfield went to a new body, the Docks & Inland Waterways Board. 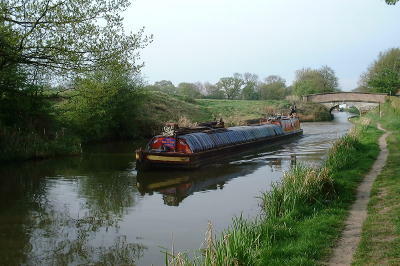 Commercial carrying finished only in the 1960's shortly before British Waterways was formed. The canal is now part of the network owned and managed by the charity, the Canal & River Trust (CRT) . 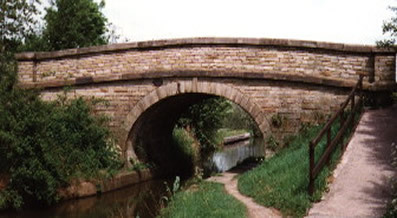 The canal is noted for its fine stone bridges - particularly the six change or snake bridges where the towpath changes sides of the canal. These bridges were designed to allow the horse to move over without having to untie it from the boat. Having gained confidence, the next project involved the full restoration of Wood's bridge 30 between Kerridge and Hurdsfield. This stone arch farmer's accommodation bridge had been much abused over the years, losing most of its top stonework and also retaining its war time defensive tank trap. This has been removed. Pictured above. Next, Gaw End bridge 47 was restored. This is an iron and timber swing bridge just north of Fools Nook and is the only working example of an original Macclesfield Canal swing or swivel bridge. There were originally about a dozen of these. Two reservoirs, Sutton and Bosley, supply the summit pound with water. Both have extensive feeder systems stretching back into the hills above the canal. These have been in serious disrepair. However, The Macclesfield Canal Society have worked with BW to bring them back into production. This work has done much to alleviate the water shortages that were a notable aspect of the canal in dry years. Find more on reservoirs and feeders. Up to date information on navigation and maintenance may be obtained from the Canal & River Trust' page. The Macclesfield Canal Society was established in 1984 in order to defend the interests of the canal and its value to its many users. Meetings are held on the second Thursday of the months September through May at the New Liberal Club, Boden Street, Macclesfield. Everyone is welcome. Outdoor meetings or events are also held in June, July and August - see our programme.